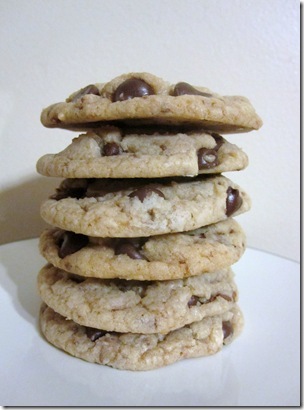 These Chewy Chocolate Chip Heath Bar Cookies are one of my best cookies to date. Soft and chewy on the inside with a crunchy texture on the outside. They’re just my favorite! I first wrote this post over 5 years ago. Since then, this recipe has become a STSL favorite and, by far, one of my most popular. These cookies are everything. They’re soft and chewy on the inside, which makes the extra crunch of the Heath bits even more yummy. 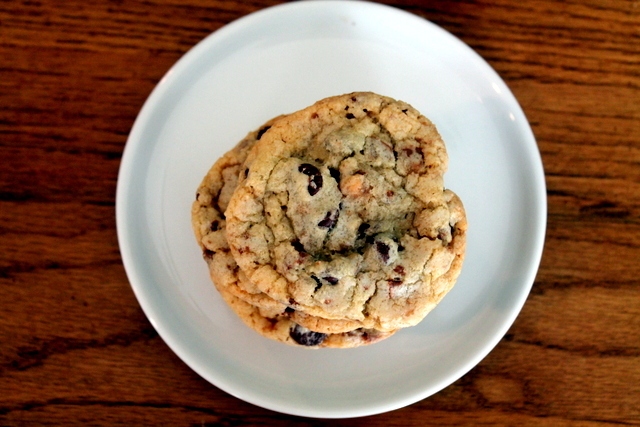 And the slight crunch of the edges just give this cookie an A+ in my book. I’ve made them with Heath bars with without. 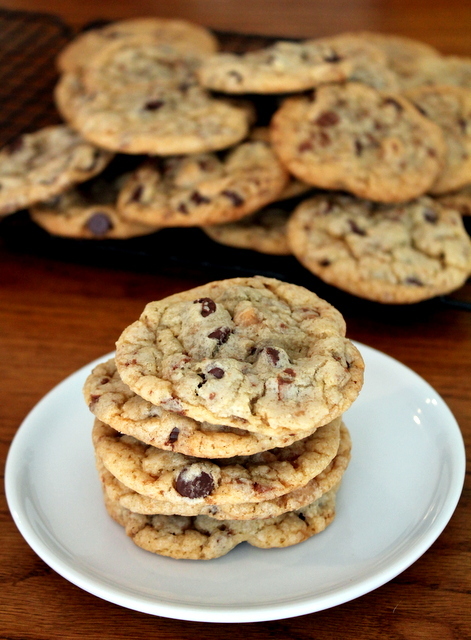 I’ve made them with chocolate chunks, I’ve made them with mini chocolate chips. 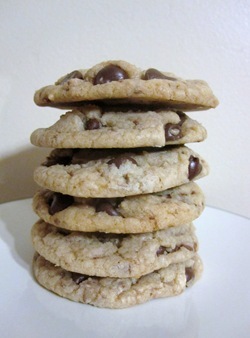 I’ve even made them with a mix of peanut butter and chocolate chips. And while they’re all delicious, the Heath always wins. Every. single. time. I will say, make sure you don’t over bake these. Slightly undercooking them is the key to their success. So even though they may look a little undone when you take them out of the oven, just promise me you’ll let them sit for a few minutes. Soft and chewy on the inside with a crunchy texture on the outside, combined with the decadent taste of the classic, buttery toffee Heath bar. Preheat the oven to 325°F. Grease cookie sheets or line with parchment paper. Stir in the chocolate chips and Heath bar bits by hand using a wooden spoon. Drop cookie dough with a cookie scoop onto the prepared cookie sheets. 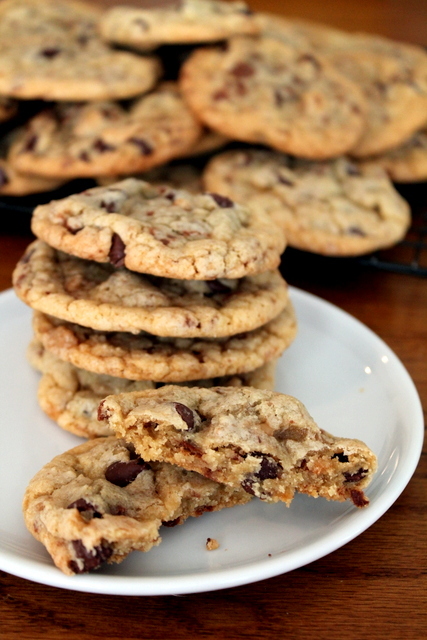 Bake larger cookies for 11 to 13 minutes, or until the edges are lightly toasted. Cool on baking sheets for a few minutes before transferring to wire racks to cool completely. ENJOY! Yay! You posted the cookie recipe. Yum! Those look great and super soft! These look great! 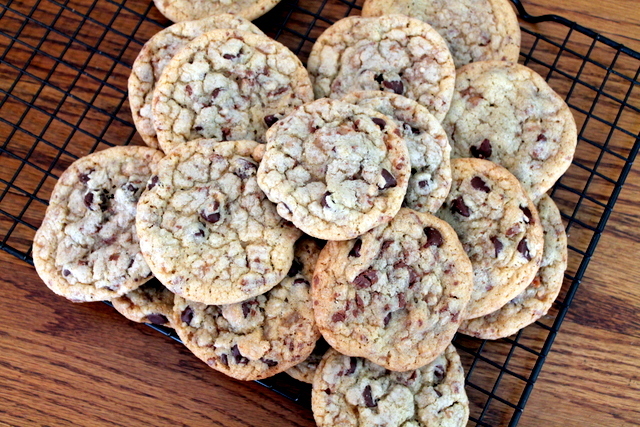 I just made a similar cookie last week - love the salty crunch of the toffee bits! Agree with you on heath bars!! Those bits are so good on frozen yogurt too!! just happened to find your blog... and so happy i did! looks amazing! 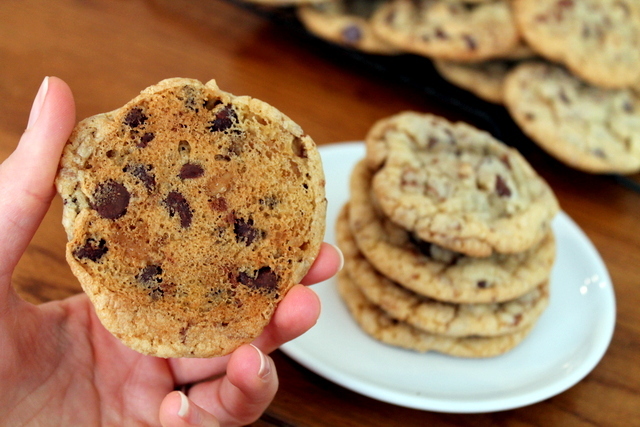 I made these last night minus the chocolate chips. I just doubled the Heath bits to replace them. YUMMY! Thanks for sharing this great recipe!!! I will be linking you up on my blog soon! this recipe is marvelous! My best friend and i just made this the other day and they are a real crowd pleaser. An all around good recipe for the whole family to enjoy!! A must make recipe! this cookie was a littel too moist for my liking. This recipe was not every specific and i ended up burning all of my cookies. i would recommend you go to my blog to see what changes on this recipe. These are the BEST cookies! Everytime I make them I get the most wonderful feedback! It's a new staple at our family get togethers, i made them for the 4th and they went so fast that my husband only got one and so he requested I make another batch just for us haha. I have no will power when they are in the house, awesome cookies!! can't thank you enough for sharing this recipe...just got them out of the oven and they are sooo delicious! i might eat them all. Hmmm, I don't know? I never ran into that problem! Maybe I take a little longer to get my batter together so it had cooled down a bit by then? 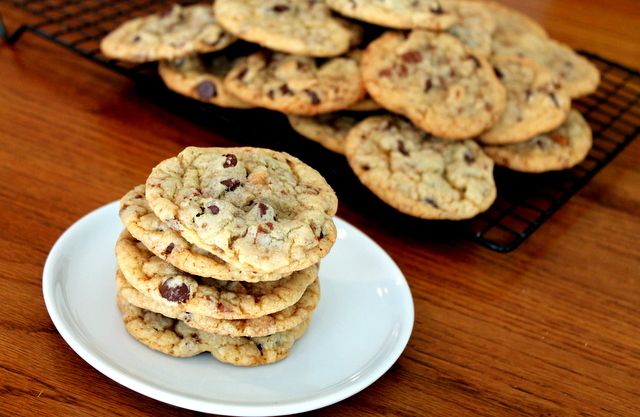 I just have to say I make these cookies all the they are the best! My whole family loves them. Thanks for sharing the recipe! Some times I add colored sprinkles to the top the kids love them! Can I add cocoa powder to the recipe and how much should I add? I'm not sure I would add cocoa powder...maybe just try extra chocolate chips? Making them now! So excited!!! Just made these amazing cookies. As I started I realized I didn't have enough brown sugar. Added 1 cup White sugar to 1 Tbls of Organic Molasses to create the brown sugar. I had miniature heath bar candies so I just chopped those up. Baked for 11 Minutes as I prefer a chewy cookie. They are fantastic. Thank you for sharing. I will watch for the big after Halloween Candy sale and pick up some more heath bar candy to make these again. Again, thank you for sharing. I just made these tonight for a part of my Christmas goodie package at family gatherings. They turned out really good! I substituted the Heath Bar bits for just the Heath bit o brickle toffee bits and kept the chocolate chips. I thought they would have been too chocolaty but I feel they could have used a little more. I'll try it with regular Heath bits next time. Thank you for this recipe! I'm sure it will become a favorite! This is the second time I made these cookies!! I use a bit less chocolate&heath but, they always turn out delicious.. This is def one of my favorite cookies! Great recipe! 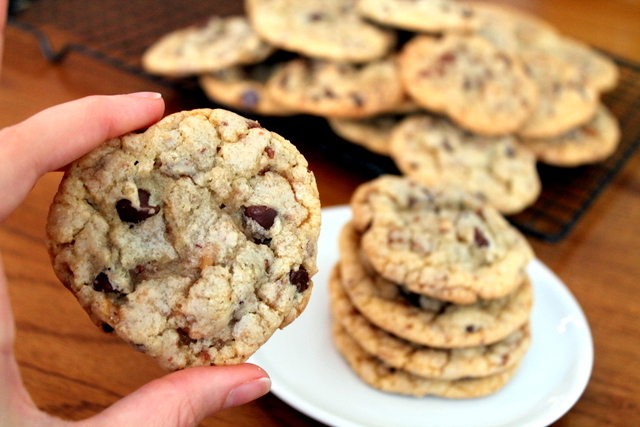 I can see how you would burn these because they are much whiter/lighter in color than regular chocolate chip cookies. You have to trust that these are done in 13 minutes or so. You can tell by the cracks along the edges that they are done. I give this recipe 4 stars!! We just made these and the are delicious! I have made these several times now and each time has been a hit! Yum, yum! Thanks for a great recipe! 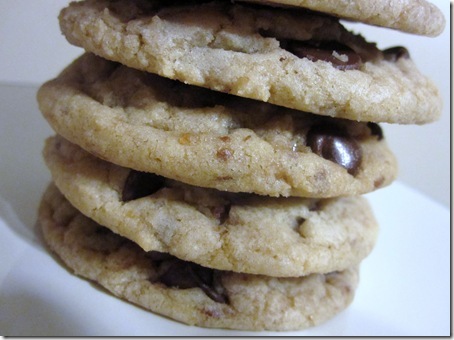 I have to say this is the BEST chocolate chip cookie recipe I have found in a long time! 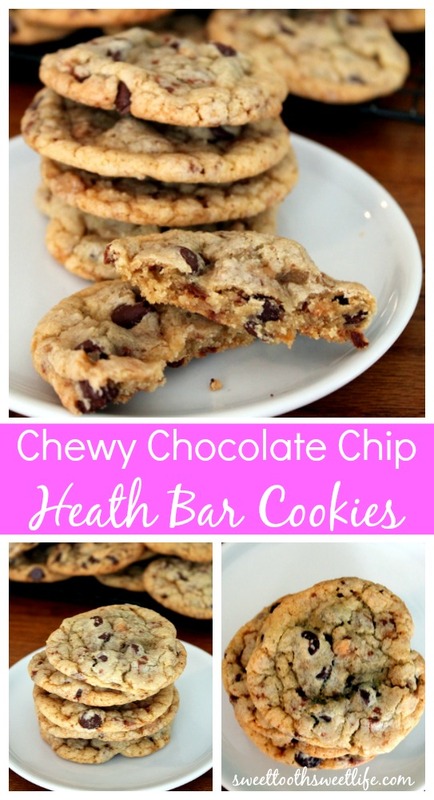 I love the addition of the Heath bar, but also the option to really just add whatever you want to the cookie, ,or just leave it plain! I even live at a high altitude in Denver, and these still come out perfectly chewy yet crispy and always delicious. 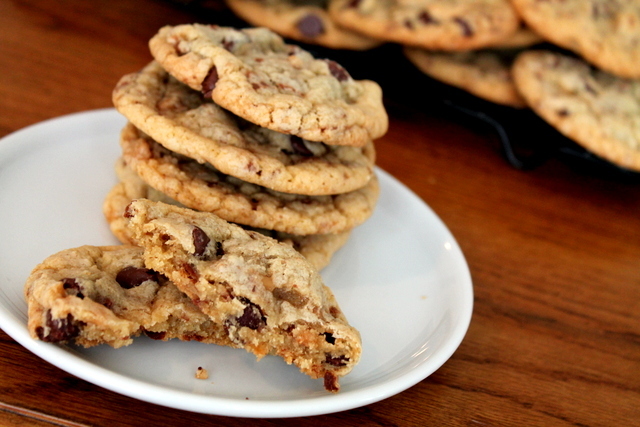 This will be my go-to staple base for a chocolate chip cookie from now on. Thank you!!! Oh I'm SO glad to hear that, Vanessa! Thanks so much for sharing!! My boss began bringing these cookies to work. We dubbed them "Crack Cookies" because they are so addicting! Yum! Made these for team treats today and the team LOVED them. One said they were the best chocolate chip cookies she's ever had. Super easy recipe, baked up beautifully, tasted delicious! Just made these!! They took 40 minutes in my oven..... And I'm still unsure if they are cooked the way. Waiting for them to cool to see! Even if they are undercooked, still good!